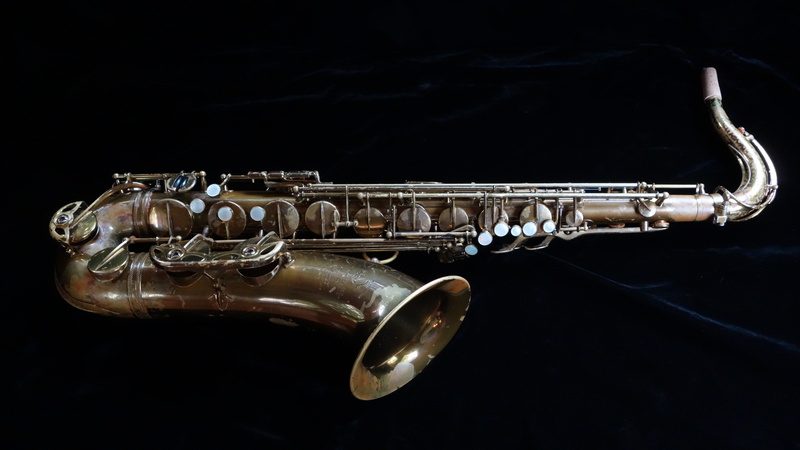 This is a 1952 Selmer Super (Balanced) Action tenor saxophone in somewhat funny-looking original lacquer, in excellent physical condition; an original un-engraved “Euro horn”. Back when this horn was made, to avoid import taxes for horns sold in the US market, Selmer Paris sent saxophones in parts to Selmer USA (which is an entirely different company, google that to have some fun because they don’t even really like each other at this point) who assembled, engraved, and lacquered them. The engraving patterns that the engravers used in the US and in France were different and thus the original market place is fairly easy to figure. And for some periods in the 1950s and perhaps later, some European market Selmers were entirely un-engraved. 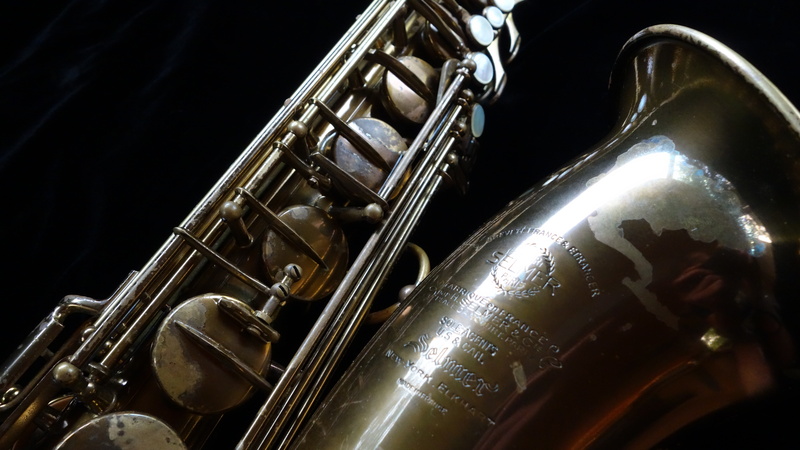 I have heard a story that the simple reason behind this is that that the engraver for Selmer in France at the time was periodically ill, and took large swathes of time off, during which saxophones went out the door without any engraving. I do not know the veracity of this statement, but its an interesting idea to ponder and yet another example (if true) of how the lore behind saxophones can be overcomplicated, and serious differences from one horn to the next can have rather pedestrian origin. Anyhow, this saxophone looks a little weird, but it is original finish. 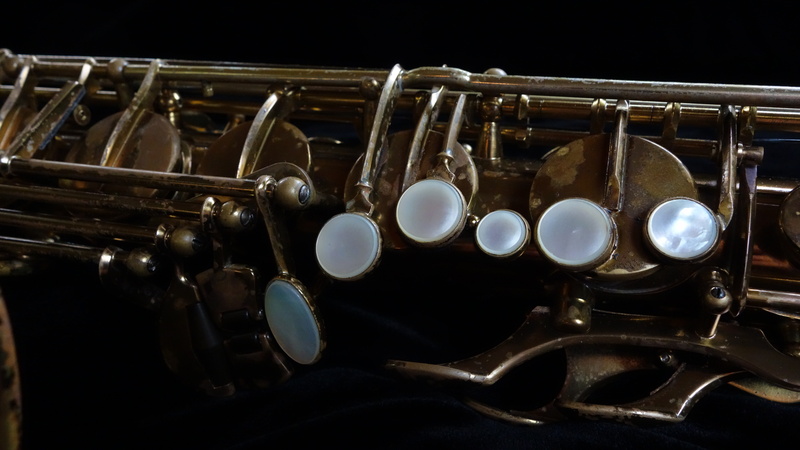 I have seen this type of coloration/flaky wear on saxophones with nitrocellulose lacquer that have sat somewhere fairly hot for a long time- like an attic for 20+ years- but I am not certain exactly how this particular came to be this color. It was striking when I first saw it, though the longer I had it on my bench the less I noticed it. Lacquer that looks like this is typically a bit delicate and this horn had not seen any use in many decades, so it was a tightrope walk to make sure that I cleaned it thoroughly enough that any flaking lacquer that would come off in normal use would come off anyways, but not clean it so roughly that any damage was done to the rest of it. 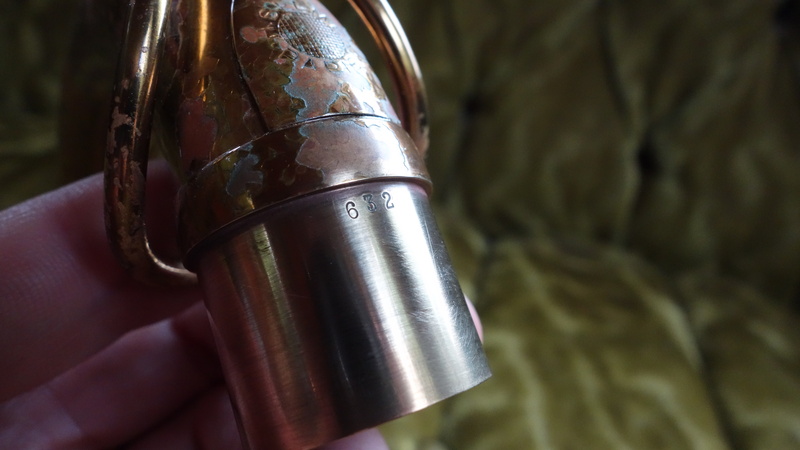 I also had to be quite careful with heating the key cups for padwork, and indeed when I was taking the old pads off for disassembly some of the flaking lacquer (typically above a spot of brass that had corroded underneath) would crisp up with the slightest amount of heat (and thus fall under the its-going-to-come-off-anyways category). So most of the cleaning on this horn was done by hand with cotton swabs of the type typically used for gun-cleaning or art restoration, one tiny bit of corrosion at a time. I would estimate that maybe a square inch total of flaky or otherwise damaged lacquer was removed in total, and now under normal handling it doesn’t shed any tiny flakes and I expect that it has reached a state of equilibrium that should last for a good long while. I also (carefully) soldered the body-to-bow joint, which was unattached (a dry joint) as is typical of Paris-assembled horns and can be leaky or full of green and juicy corrosion or both if left that way. The rest of the overhaul was fairly standard, and I used Reso-Tech resonators at the owner’s request. This saxophone ended up playing extremely well, with a HUGE tone that is very recognizably Selmer. 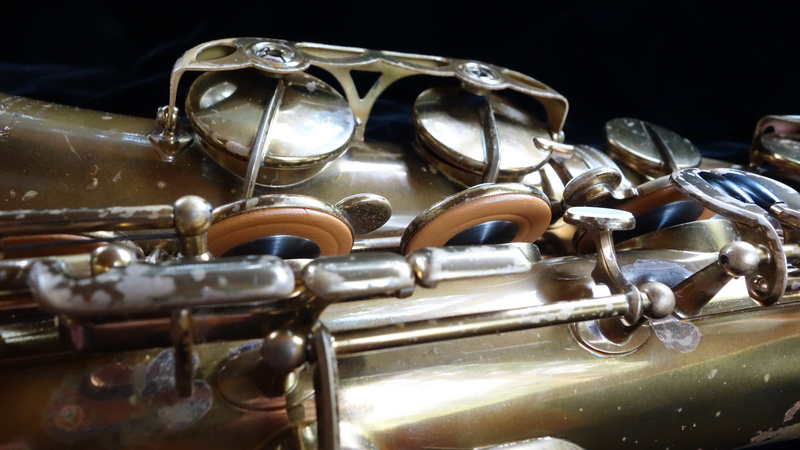 Response is quick, the keywork is comfortable and medium-light, and in general this horn is everything you would want a Selmer Super (Balanced) Action tenor to be.